How did Bute businesses do in a wet and windy tourist season? Ann and Tim Saul, owners of Brechin's on Bridgend Street. With the nights drawing in and the ferry schedule switching over, the annual tourist season on Bute is coming to an end. And with a Federation of Small Businesses survey of Scottish island businesses released this week saying 88 per cent face challenges mainland businesses don’t, how have Bute’s entrepreneurs and business owners coped in an unusually wet and windy summer? The Bute Brew Co has hosted a number of events across the year, with a whisky festival to follow this weekend. Tim Saul and wife Ann run Brechin’s Brasserie in Rothesay, and are heavily involved in the island’s music scene. Tim told the Buteman: “I think the Road Equivalent Tariff has had a positive impact, as well as the renovation of the Glenburn Hotel. The Road Equivalent Tariff (RET), introduced by the Scottish Government in 2015, reduced ferry fares on Caledonian MacBrayne sailings based on distance travelled. Because Arran is further from the mainland than Bute, sailings to Arran received bigger discounts, and this contributed to a recent upsurge in Arran’s tourist industry. Business owners in Rothesay, including Aidan Canavan of the Bute Brew Co, have said that greater engagement and collaboration between island businesses is needed to emulate Arran’s recent success. The Bute Brew Co has been at the forefront of a number of food and drink festivals, with the Isle of Bute Whisky & Beer Festival due to take place this weekend. Tim Saul also spoke of the differences between the islands: “I think Visit Bute are doing a good job of making a difference with limited financial resources. 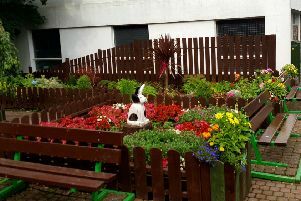 “Comparing it to Arran, VisitArran have full time staff and they have capitalised on what the island has to offer, even though in truth there is probably more to do on Bute. Angie Phillips moved to Rothesay from England and this is her first season running the Black Bull pub with her partner Scott Hatton. The two have built up a relationship with local bands and organised themed nights including an 80s quiz night and a Hallowe’en party. Asked about the BBC survey, and whether island businesses have to work harder to maintain a customer base, she said: “I’m not sure, you have to work hard at it wherever you are, on an island or not. “That said, a few times this year we have had to adapt to things like the Waverley being off and people from the mainland having to cancel their bookings.